Rooster Chronicles Pt.2 : Is this goodbye? When I'd last said goodnight to Roosevelt, he was walking up the center line of Thomas Run in the pitch black night. There was nothing we could do. I'd given up hope of his survival through the night. again, he crowed. And I listened as he made his way around the house. through the whole escapade. Thank goodness for sound machines. There was nothing we could do. We called it a night. And then I sent that email. The rooster must go. next evening, was a repeat of the one before, but one thing differed. Around 2a.m, I heard clucking and squawking outside my bedroom window. "Dan!!! Roosevelt is getting eaten! Get out there and stop it! Please!!" were coming from across the road. I hated to think it, but I figured a fox was dragging him away. even one of the cats. That morning, there was no crowing. so long before it is discovered and gobbled up. done everything we could. Our rooster interventions had failed. He didn't want our help. And now, everything was back to normal. Just six little hens and three little ducks. Roosevelt still had more story to tell. That afternoon, I was out running errands when my cell phone rang. It was Emma. "MOM! YOU WILL NEVER BELIEVE THIS! 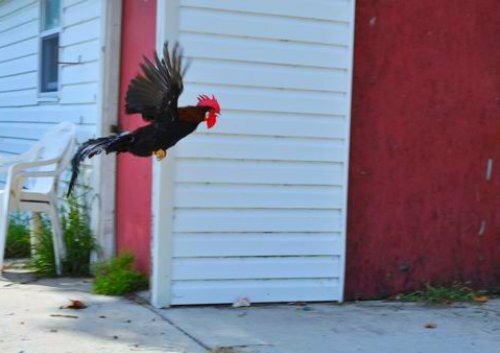 The neighbors up the road just called and said our rooster is running around their farm!" a neighbor's farm. I even clocked the distance–it was at least half a mile. But Roosevelt was nowhere to be found. We left empty-handed. No rooster. No Roosevelt. Either Roosevelt now belongs to the people and farms and homes of Thomas Run. Or he belongs to heaven. And I suppose, that's the end of the story. his way back up Thomas Run to his first home. Or, for that matter, a yellow taxicab to stop at the end of the lane and drop him off. omg! that rooster certainly has a flair for the dramatic! Great story! I’d be willing to bet he’ll be waking you up early one morning over the next week. He sounds a little too spunky and crafty to be gone already. Keep us posted. And thanks for the smile this morning! Rooster drama – somehow I think there might be a third installment. Oh, Molly! Thanks for not keeping us hanging too long today. What a great story – I hope you are awoken again by his crowing outside your window. That rooster is sure something! I have to admit I quite enjoy his tales with my morning tea. That is such a good story! I hope he does not head over this way! Oh my word… THE SAME THING happened to our rooster. Renegade. Sleeping outside. Too tough for the coop at night. Crowing at insane hours. And then, one sad night, a racoon met up with him. And there was a husband on the porch with a gun. And then there was fleeing of all sorts. But Our rooster (Amy. It’s a long story.) did not make it. For sure. He put up a good fight though. I’m sure he’ll let you know if he arrives! What an unbelievable story, its incredible, really! It could happen… Our dogs went crazy one day and went after our chickens (which we don’t have anymore). One of the chickens ended up hiding in a tree for a few days before it came back… We had no idea! Molly, I loved the Rooster Chronicles! I’d bet you could find all kinds of helpful symbolism in this story… you should have named him James Dean. Rebel Without A Cause. Beautiful writing! Oh my. I don’t know whether to laugh or cry at the story of Roosevelt the Rooster! Roosters didn’t seem to have a long lifespan on our farm, unlike the neverending feral turkeys that took up residence in the radiata pine trees.